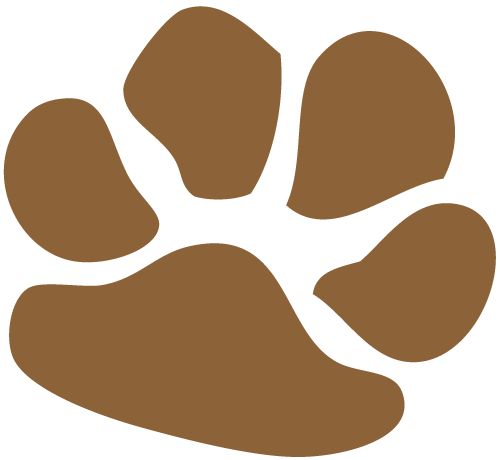 dogIDs has taken the initiative to continuously improve the lives of dogs through our Paw it Forward program created in 2015. 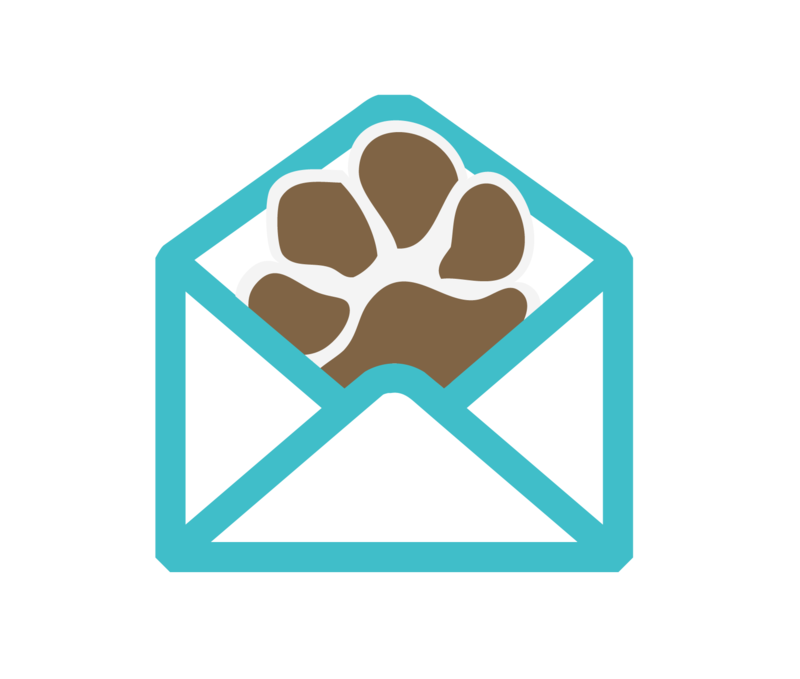 The program gives our incredible customers the opportunity to donate to dog-related nonprofits. We are committed not only to providing our customers the chance to give back but to living out this value ourselves. dogIDs will match 10% of the donations received up to $1,000 to our partnered nonprofit. We have partnered with RedRover in the past and are excited to collaborate once again. 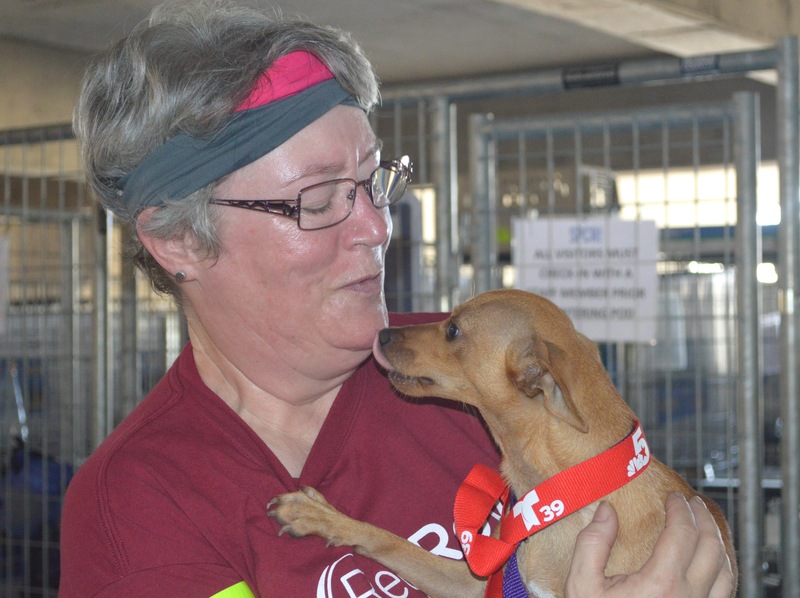 RedRover is an organization focused on caring for animals that are rescued from natural disasters or neglect as well as treating animals with life-threatening illnesses. They also provide help to domestic violence victims seeking safety with their pets. Through their Relief, Responders and Readers programs, they provide resources such as temporary emergency shelter, financial assistance, emotional support, and education. When Hurricane Maria created a dangerous situation for hundreds of animals around Puerto Rico, there was no choice but to relocate them. Dogs and cats were airlifted to St. Hubert’s Animal Welfare Center in Madison, New Jersey, where RedRover Responders were ready to help. They worked tirelessly at the shelter for six days as more animals were flown in. This was their third deployment within five weeks, as they were also caring for animals displaced by Hurricane Harvey and Hurricane Irma. 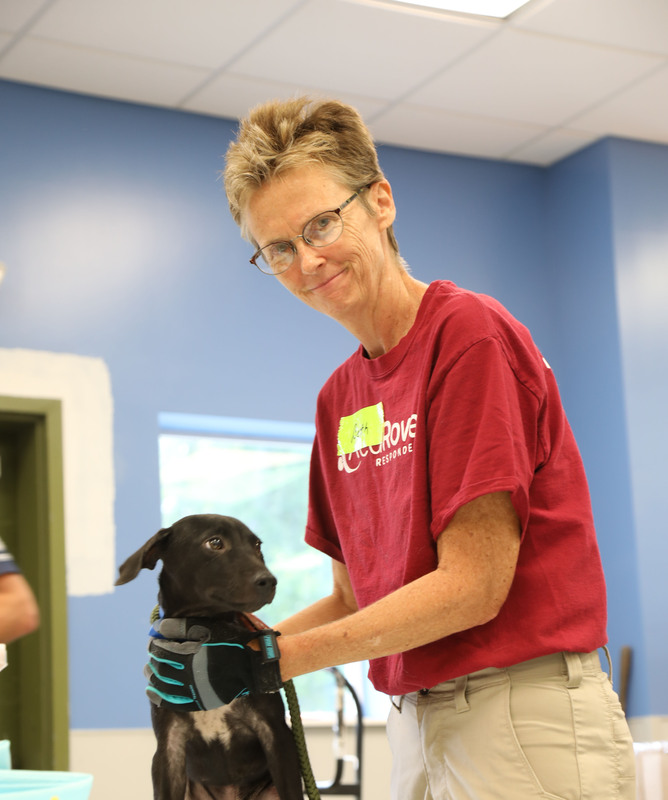 This shelter, as well as Michigan Humane Society, has requested emergency sheltering training from RedRover’s Director of Field Services, Beth Gammie to increase their cruelty and disaster response efforts. If it weren’t for RedRover’s dedication and compassion, many of these animals would not have had such a great chance at finding a loving home. RedRover Responders are taking their cause one step further by identifying communities often impacted by natural disasters and teaming up with local organizations in those areas. One of their partnerships is with Animal Investigation and Response in Fort Worth, Texas. After experiencing natural disasters like Hurricane Harvey, animal shelters see an average of a 25% increase in animals because of a lack of housing options for people with pets. To help with animal transportation after such events, or other cruelty responses, RedRover purchased a co-branded transport vehicle and trailer. This will help with the immediate transport of animals away from overwhelmed shelters or evacuating large numbers of animals should another disaster strike. 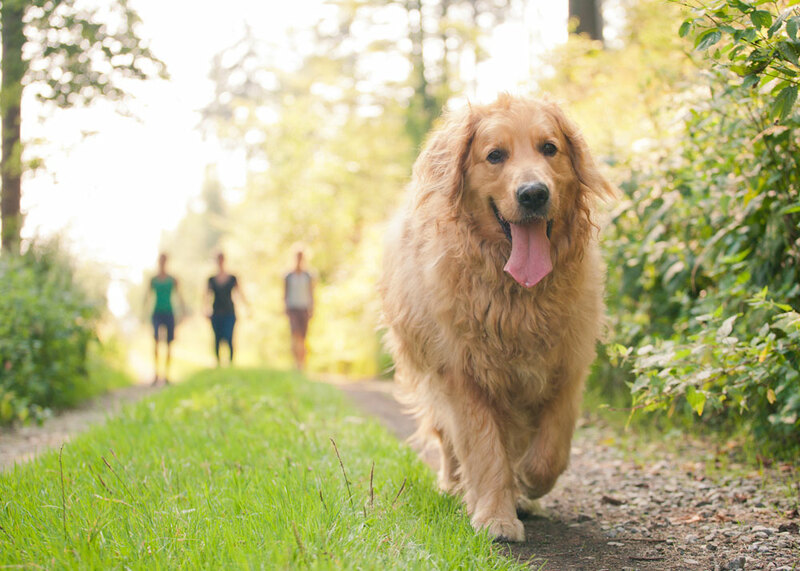 In 2016, RedRover set out on a journey to complete three goals over the next five years. As of today, they are well on their way to meeting each of them. 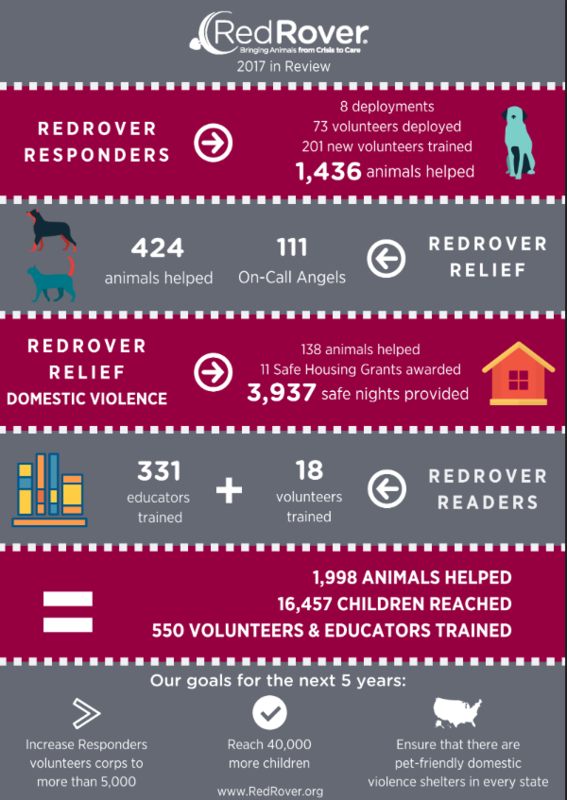 * RedRover wanted to have 5,000 Responders volunteers by 2021, of which they currently only need 1,000 more. * They are also more than halfway to accomplishing their goal of reaching 40,000 more children through their Readers program. So far they have reached approximately 25,000 children throughout the United States. * Their final goal was for there to be at least one domestic violence shelter that offers pet-friendly programs in each state. When dogIDs last partnered with RedRover, there were nine states without such programs. Thanks to an incredible anonymous donation, they have awarded Safe Housing grants to domestic violence shelters in three of the nine states. Improving the lives of dogs is what dogIDs has set out to do and we believe in supporting those who feel the same way. Last year, through our incredible customers, we were able to raise $2,363 for RedRover and dogIDs matched an additional 10%. If you’d like to help RedRover continue their mission, you can donate through dogids.com at checkout or directly on their site. ￼Hi! My name is Sabrina and I’m a content and marketing intern with dogIDs. I am currently studying Retail Merchandising at North Dakota State University. I enjoy reading and watching Netflix, but my favorite part of the day is taking my dog, Peanut, for a walk through the park.